Doors 7 pm, showtime 8 pm, duration approx. 2 hours with interval. Trumpet player Jukka Eskola (b. 1978) has delighted the Finnish jazz scene with his music for over twenty years. Eskola has played dozens of times with UMO Helsinki Jazz Orchestra’s trumpet section, and last summer he stood up as the orchestra’s soloist for the first time at a few festival gigs. In this series of three concerts in May, UMO Helsinki presents compositions from Eskola’s exhaustive list of recordings in soul and bossa nova, including a couple of pieces from his album that comes out in spring 2019. The conductor of the concert, Mikko Hassinen, has made fresh big band arrangements of these compositions. 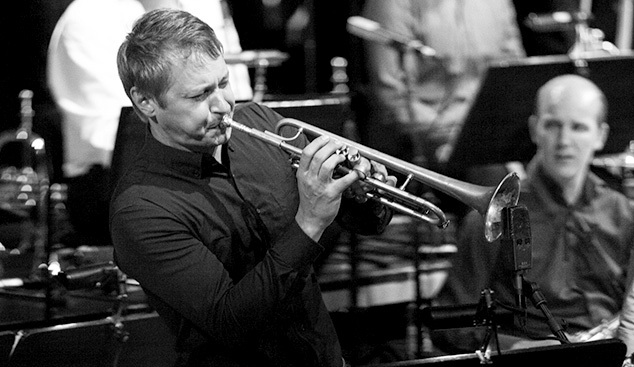 In addition to his own bands Jukka Eskola Soul Trio, Jukka Eskola Quintet and Jukka Eskola Orquestra Bossa, the busy trumpeter has played in the groups Five Corners Quintet and Ricky-Tick Big Band. Eskola has six solo albums, about 200 album tracks, Pori Jazz Artist of the Year award, several Emma nominations, theatre productions and many teaching posts under his belt. Eskola also plays in orchestras of various television programs.